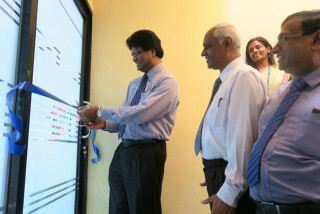 OpenArc Systems Management(Pvt) Ltd, a leading SriLanka software company established in 1991, is gearing to partner with a local bank in its journey to venture abroad. Official said. 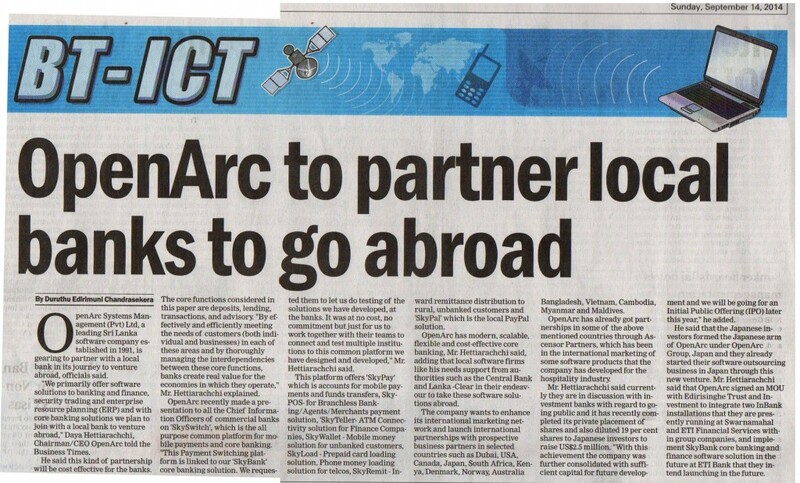 security trading and enterprise resource planing (ERP) and with core banking solutions we plan to join with a local bank to venture abroad,”Daya Hettiarachchi, chairman/CEO OpenArc told the Business Times. He said this kind of partnership will be cost effective for the banks. The core functions considered in this paper are deposits, lending, transactions, and advisory, “By effectively and efficiently meeting the needs of customers (both individual and businesses) in each of these areas and by thoroughly managing the interdependencies between these core functions, banks create real value for the economies in which they operate, ” Mr. Hettiarachchi explained. OpenArc recently made a presentation to all the chief Information Officers of commercial banks on ‘SkySwitch’, which is the all purpose common platform for mobile payments and core banking . “This Payment Switching platform is linked to our ‘SkyBank’ core banking solution . We requested them to let us do testing of the solutions we have developed, at the banks. IT was at no cost, no commitment but jest for us to work together with their teams to connect and test multiple institutions to this common platform we have designed and developed, ” Mr. Hettiarachchi said. This platform offers ‘SkyPay’ which is accounts for mobile payments and founds transfers, Sky-POS for Branchless Banking /Agents/Merchants payment solution, ‘SkyTeller-ATM Connectivity solution for Finance Companies, SkyLoad -Prepaid card loading solution, Phone money loading solution for telcos, SkyRemit -Inward remittance distribution to rural, unbanked customers and ‘SkyPal’ which is the local PayPal solution. The company wants to enhance its international marketing network and launch international marketing network and launch international partnerships with prospective business partners in selected countries such as Dubai, USA, Canada, Japan, South Africa, Kenya, Denmark, Norway, Australia, Bangladesh, Vietnam, Cambodia, Myanmar and Maldives. OpenArc has already got partnership in some of the above mentioned in some of the above mentioned countries through Ascensor Partners, which has been in the international marketing of some software products that the company has developed for the hospitality industry. Mr.Hettiarachchi said currently they are in discussion with investment banks with regard to going public and it has recently completed its private placements of shares and also diluted 19 per cent shares to Japanese inventors to raise US$2.5 million. “With this achievement the company was further consolidated with sufficient capital for future development and we will be going for an Initial Public Offering (IPO) later this year ,” he added. He said that the Japanese investors formed the Japanese arm of OpenArc under Openarc Group, Japan and they already started their software outsourcing business in japan through this new venture. 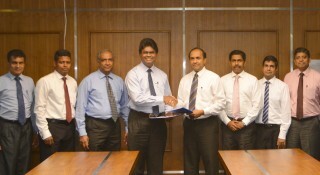 Mr. Hettiarchchi said that openArc signed an MOU with Edirisinghe Trust and Investment to integrate two InBank installations that they are presently running at Swarnamahal and ETI Financial Service within group companies, and implements SkyBank core banking and Finance software solution in the future at ETI Bank that they intend launching in the Future. Ventura Crystal Investment (PVT) Ltd selected OpenArc InBank software solution to support their financial software requirement. The solution includes Leasing, Hire Purchase, Loans and General Ledger modules. A Website developed and maintained by OpenArc and managed by Ananda College ICT society for the benefit of entire school network of IT students and teachers. Obtain answers to all Software, Hardware and Education related questions through SNICT FORUM. Post your ICT related news, articles, creative work or announcements to SNICT BLOG. Access educational web-content developed by OpenArc for the Ministry of Education for school subjects such as Mathematics, Science etc. Publish your school resource requirements and invite donors such as OBA members to help of your school. Listen/download free ICT knowledge sharing lectures / presentations published in the site. 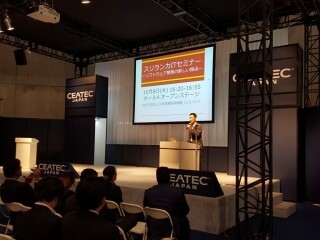 Participate in ICT competitions through the website. You may now register your ICT society of your school through SNICT and get experience the world of IT.